Last month Representative Luis Gutierrez ridiculed SB1070 and similar laws, by asking, "Who's the immigrants? Justin Bieber or Selena Gomez." A very telling observations that unearths the racial profiling with which draconian anti-immigrant laws are enforced. Here, we see another example. Former Governor of Arizona, now 96 years old, was detained by border patrol after radiation from treatment triggered an alarm at a checkpoint (as noted below). The trigger is understandable, but one still wonders if Justin Bieber would have been detained also. After all this isn't the first time his citizenship has been questioned by authorities. This man is Raúl Héctor Castro. 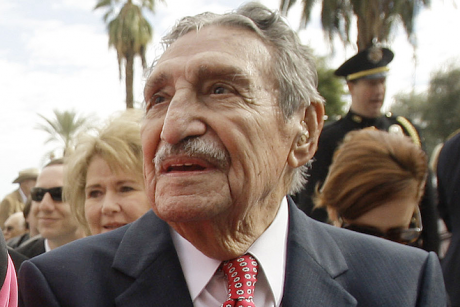 He is 96 years old, a former Arizona governor, and a former United States Ambassador to El Salvador, Bolivia and Argentina. He was born in Mexico, and is a United States citizen. Last month he was stopped by U.S. border patrol agents after residual radiation from a medical procedure he’d recently undergone triggered an alarm at a checkpoint in Tubac, AZ. The 96 year-old heart patient was then forced to exit his vehicle in the 100 degree Arizona heat and wait in a tent in a business suit, even as his companion begged the agents not to subject an elderly man to such treatment.